Leaking / blown crank seal symptoms? Hi all, hoping someone here with a little more experience in these matters might be able to confirm what I believe must be a leaking crank seal on the front cylinder of my KR250. 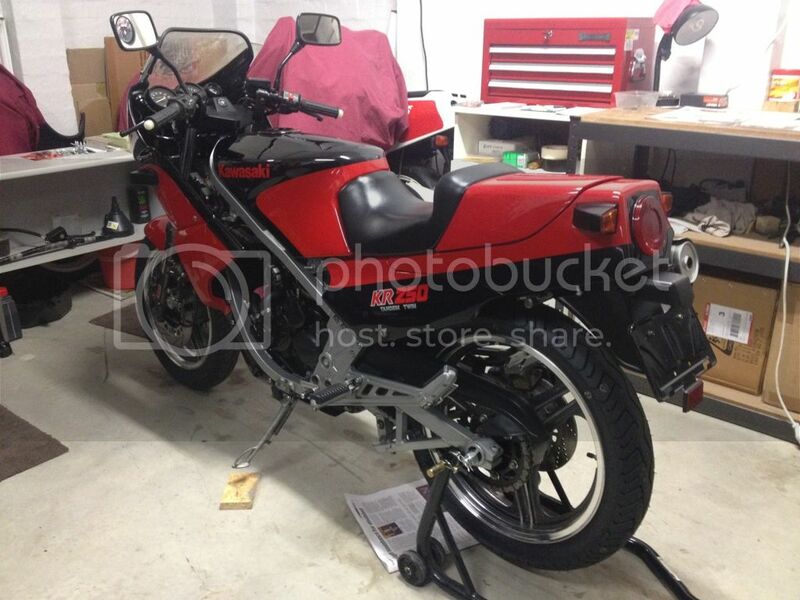 The bike is a low km (4,900) jap import and clearly the engine has never been touched. I've been slowly recommissioning the bike but the focus has been the chassis, brakes etc. as the bike started and ran fine when I bought it, though I must admit I did wonder whether I should've had the engine pulled down for an inspection at least. Anyway, the bike is basically finished and has come up a treat, it looks amazing and I'm very happy with it, except on its first little blast down the road it started spitting oil out of the lower pipe muffler, out the end and out the bolt holes that hold the muffler sleeve on. The oil doesn't appear to be two stroke so it must be gear box oil so I assume I have a blown or leaking crank case seal on the front cylinder. The muffler still has notice suppression packing around the baffle (which I assume aren't removable) and this is soaked in oil. So, I'm no engine expert but is this the correct diagnosis or is this something else? I read in the manual that you need to remove the rear cylinder & head in order to remove the engine from the frame, is this right? Appreciate any advice form the experts. Re: Leaking / blown crank seal symptoms? One more thing, it isn't oiling the plug on the front cylinder which I would've thought would happen if a crank seal went? It also didn't blow much exhaust smoke at all and certainly no white smoke that I've read is also a symptom of leaking crank seals. I bought a KR for a spares bike & crank seal had gone on that and it blew plenty of grey smoke (gearbox oil). From the description you give it doesnt sound like a crank seal to me. What I have noticed is as I leave my kr for long periods between rides it does smoke a lot on start up but soon clears a k or 2 down the road. Given the low ks on your bike (in my experience they seem to self destruct around the 30-40k mark if not maintained) & the fact it hasnt been run for some time it might just need a good run? How far did you test ride it & how much oil is spitting out? Thanks for the responses. A few others have also said I might be 'jumping the gun' on the crank seal diagnosis so will try a few other things first. Will remove the pipe and clean it out. Someone mentioned it might be a sticking oil check valve (not sure what that is but wil consult the manual). It wasn't blowing much smoke at all and the gearbox oil doesn't appear to have dropped and nor did the old oil smell of petrol which someone suggested is another tell tale sign if crank seal failure. But I only rode it about a km or so. Oil was dribbling out the end of the muffler but the pressure was forcing it out of the bolt holes holding the muffler on - enough to spray a small amount over the rear tyre. As I mentioned the muffler packing is soaked in oil so I'll rip this out (it doesn't appear as though the baffles are removable) when I clean the inside of the pipe. Its weird coz my bike did the same thing for a while then cleared itself up. Im constantly watching the oil window to ensure there is no water contamination and the level stays the same. have you done a test on the oil pump and synchronized the carbies?